The Australian Education Union has more than 185,000 members nationally in schools, TAFE institutes, Corrections Education, Adult Migrant Education Services and early childhood education centres. The AEU has a long history of supporting and defending the rights of Aboriginal and Torres Strait Islander people. We ensure all governments are held to account for their responsibility to improving outcomes for Aboriginal and Torres Strait Islander peoples. The AEU campaigns and lobbies for fairer funding and resourcing for Aboriginal and Torres Strait Islander students from pre to post school education. The AEU also works to ensure that non - Aboriginal and Torres Strait Islander teachers and workers have an understanding of Aboriginal and Torres Strait Islander peoples, histories and cultures and that the Australian curriculum includes these perspectives. Currently the AEU is working to ensure significant ongoing funding for schools to assist public schools, teachers and students to improve the achievement gap and retention rates for Aboriginal and Torres Strait Islander students. The AEU is also lobbying for the maintenance of a high quality, publicly funded TAFE system that can continue to meet the diverse needs of Aboriginal and Torres Strait Islander students. The AEU works closely with the ACTU and other unions to ensure that Aboriginal and Torres Strait Islander peoples have fair employment and working conditions no matter what industry they work in. The AEU is a proud supporter of Reconciliation Australia . 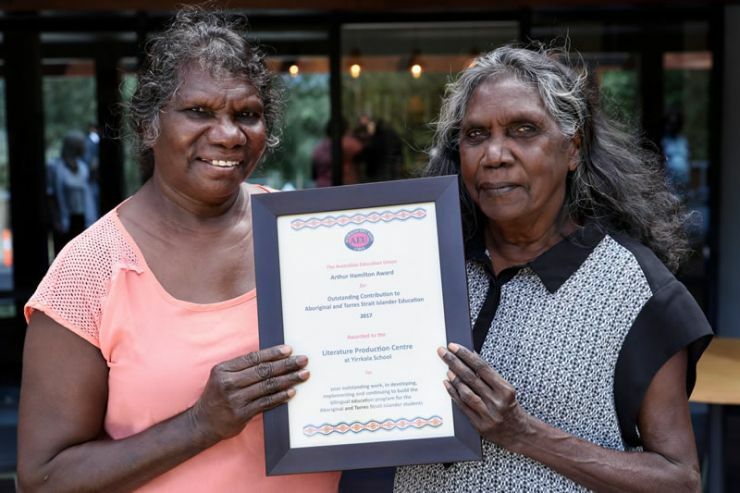 Rärriwuy Marika and Yalmay Yunupiŋu recipients of the AEU's 2017 Arthur Hamilton Award for Outstanding Contribution to Aboriginal and Torres Strait Islander Education.